I don't too. Exclamation point. For me, love does not occur the moment you see this beautiful creature with a charming smile. Love does not happen the moment your eyes meet after you both slip on the floor and you fall (literally) on each other. Nor does it happen when bump into him while walking mindlessly in a busy street. I do not consider it love. I call it attraction. When you blush, when your heart races, that's attraction. 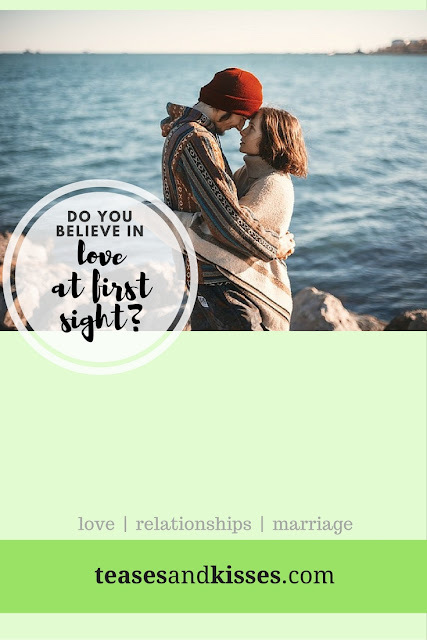 If you mean a different thing when you say "love at first sight," then maybe I would believe in it. If you mean: when you have fully known your partner, seeing for the first time the real person beyond the physical appearance, seeing and realizing for the first time that you are like a "lock and key" combination. Then that for me is love at first sight. for me, love is something more than attraction. yes, it may begin with attraction, but it is not yet love in the first place. love comes after attraction, after you have known him and you feel there is something more than that. love is a choice, it is a commitment, that even after physical attraction fades, you still want to be with the person, you still want the best for him, and you still want his happiness. love is a higher form of attraction, something more pure and more noble, that sometimes, it may also include sacrifice. As we stated in the previous blog post: why do you love your spouse. Loving is not just because of what a person can do for you, nor is it just because who the person is, but it should be because who you both become when you are together. There should be growth, sacrifice, compromise, a give and take relationship. And there is no chance for that to happen in a "love at first sight" experience. "love is not just a feeling or emotion, it is the choice you make everyday, to dote this one and only person everyday. and it is a decision you make everyday - every single day." attraction, however, is an essential part of a relationship. you need to stay attracted to your spouse (and only your spouse) to stay in love. you need to find ways to keep the attraction. if you do believe in love at first sight, then it must be love when you wake up each day, when the first thing (person) you see is your spouse beside you. why do you love your spouse?